OK, this post isn't about authentic food, but hey, it is about a uniquely Japanese tradition. 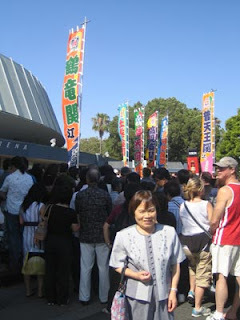 I have to share some photos and observations from the big Sumo Tour that was in Los Angeles Saturday and Sunday, June 7-8. 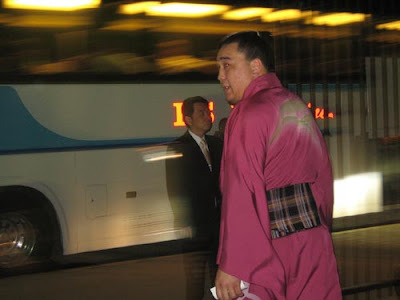 The Sumo Tour is like an All-Star game in other sports: the top Japanese sumo wrestlers travel to other countries for a cultural and educational exchange that promotes their sport and expands their celebrity. 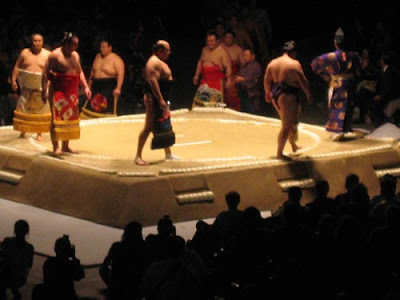 The Sumo Tour has also been to Hawaii, Las Vegas and Europe in years past; during their visits, the wrestlers present exhibition matches so we foreigners can get a taste of the unique traditional sport that is actually pretty challenging to see live in Japan, unless you're wealthy or have connections for tickets. My 4-foot-9 mom is a huge sumo fan (pun intended) who faithfully watches the real Japanese matches on her Japan TV network feed daily during the 15-day tournaments (the Tokyo tournament was held in May). 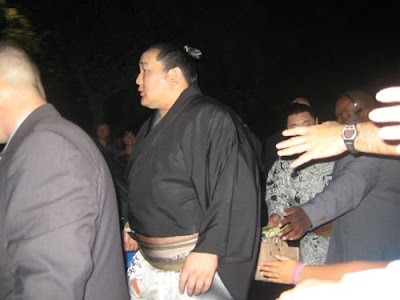 So when I heard the Sumo Tour was bringing these gigantic stars to Los Angeles, I got online immediately and bought tickets for my parents and me to attend the first day, and I presented them to my mom and dad as their Mother's Day and Father's Day gifts. "OH!" my elated mom exclaimed, "Your dad and I got so excited about the Sumo Tour but didn't think we could go because of how expensive tickets are!" This was clearly the best Mother's Day gift I ever got my mom. So we headed to the L.A. Sports Arena Saturday afternoon and arrived just after the gates opened at 4 p.m.
After standing in line to get in - and our purses given a cursory search by arena staff - we were pleased to find our seats in the middle loge level had a perfect view of the sumo ring, which allowed us to see all the moves clearly, plus even the occasional dramatic tumble off the ring by the giants. 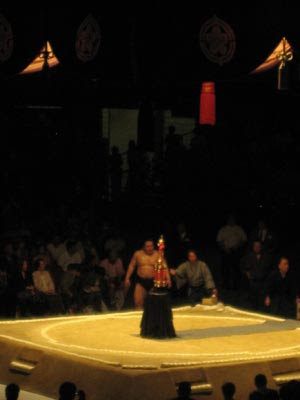 There were some theatrics during the matches -- some obvious staredowns between wrestlers and even some overly dramatic posturing by Takamisakari during the ceremonial faceoff before a match -- that my Mom said are never done in the real matches, and were clearly for entertaining Americans. Entertain they did: the crowd ate it up, hooting and hollering and encouraging more. 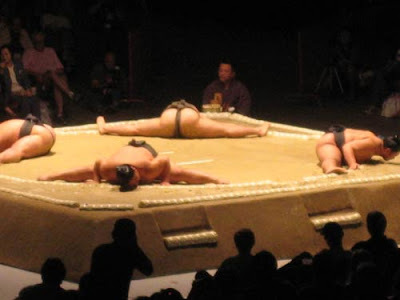 Of course, all of the rituals in the real matches in Japan are very serious and characteristically honorific, with the faceoff actually being a moment for the wrestlers to greet each other with a modicum of respect -- not an in-your-face, "I'm gonna bring you down" moment. 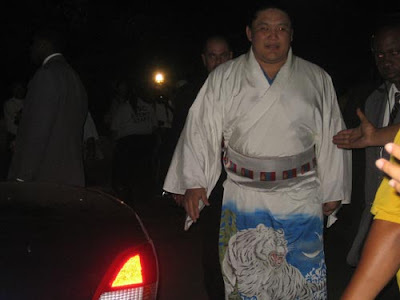 The champion of Sumo Tour Day 1, not surprisingly, was Yokozuna Asashoryu, a consistent winner, originally from Mongolia, whose aggressive tactics elicit either strong love or hate among sumo wrestlers and watchers. My parents and I literally stumbled onto the exit where the sumo wrestlers were coming out to big buses that would take them to their hotel (The Wilshire Grand). We were looking for the parking lot where our car was when we saw a small crowd kept at bay by yellow tape, and the buses lined up nearby. I came away with a newfound respect and admiration for these impressive athletes. 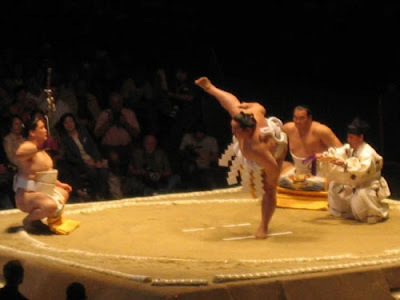 Sumo had always seemed somewhat comical to me, more entertainment than sport. 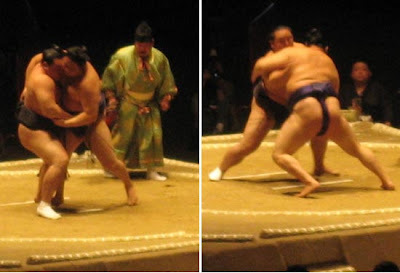 But by allowing me to see these grand gentlemen up close, the Sumo Tour succeeded in educating and drawing me into this unusual sport. Wow, if I could do those splits, mama mia!!! Looks like you had a great time and I had no idea that these guys were so fit and flexible... thanks for the insight into the world of Sumo! The tiger kimono is beautiful.